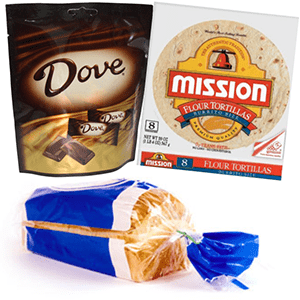 GPS is a worldwide leader in the production of custom printed food packaging, bakery bags and stand up pouches. This category covers a huge variety of custom printed and folded polybag materials. We have decades worth of experience working with some of the largest corporations to the smallest start up companies looking to “bagvertize” their product. Competition in the food packaging field is fierce, with many companies to choose from. We have worked with and custom designed packaging for virtually every type of food product. All of our bags, including our stand up pouches, side gusseted bags and flat pouches are FDA approved food safe, ready for packaging any type of products including coffee, teas, fruits, nuts, grains, jerky, spices, pet food, liquids, breads and more! We offer the highest quality food bags that protects your product against light, oxygen and moisture, adding to the product’s shelf life. 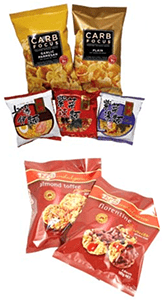 Stand up food bags come in a variety different styles – standard, metallized, windowed, rice paper and snack pack. All stand up pouches features a bottom gusset that allows the bags to stand on their own whether they are filled or empty. Window, rice paper and some standard stand up pouches feature a clear, viewable area to see what is inside the bag. Stand up food bags make for a cost effective way of packaging your products because of their ability to stand on their own on the shelves. Hang holes are also available. Why buy your food packaging, bakery bags, stand up pouches and product packaging from GPS? We are proud to be one of the leaders in degradable and biodegradable plastics. We can produce any size and style bag for food packaging. Call one of our very qualified food packaging specialists or one of one graphic artists today to receive a no-hassle, no-obligation quote and design consultation today!